Hello and welcome to our Expedition Earth week on Antarctica! We’re nearing the end of our journey and we’ve had so much fun. We spent some time reviewing all of the countries we’ve learned so far, 30 of them WOW! Next we completed the Antarctica mapping sheet. We located Antarctica on the map. Here was my whiteboard for the week: We talked about the lowest temperature recorded in Antarctica of –127 degrees! Yikes! They kids loved to see the word “NONE” next to each category. Since Antarctica is internationally owned, it has no flag of its own. The kids had a great time designing their own flags. They were also slightly excited for the end of school to be so near. We made a visual of an iceberg. Actually this was my preschooler’s idea. She came in with a glass full of ice and said look mom, it’s mostly underwater with just a little bit above. Just like icebergs! Superb my little Padawan! We also made sure to do our mini-books so we’d have them ready for the final world lapbook! YAY! Next we did a fun blubber experiment. Yes, I just said “blubber” on my blog. We filled a bowl full of ice then added water. Next I filled a sandwich bag with crisco vegetable shortening. I carefully inserted another bag inside of the crisco filled one and smushed the crisco all around my hand. Next I let the kids try the experiment. They placed one hand in a plain baggie, and the other in the blubber baggie. Definitely cool to see how the blubber helps keep the animals of the Antarctic warm and cozy in those icy waters! And that my friends wraps up our week on Antarctica! Stay tuned as we head over to our final stop, The Arctic Circle, next week! What do you guys do during the summer as far as homeschool stuff? 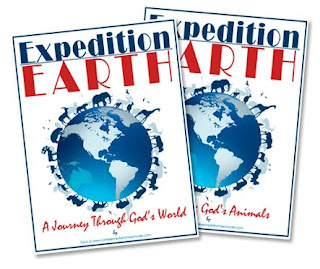 Great ideas..the whole expedition earth is a fantastic one..can't wait until my kids are old enough for it! Thanks so much for sharing. Would Expedition Earth be to easy for a fifth grader do you think? Thanks! I never would've thought of doing a blubber experiment, but that's so awesome! I'm sure my kids would get a kick out of it! I agree with Savannah, I can't wait until my kids are old enough for it! Where did you get your art caddy?